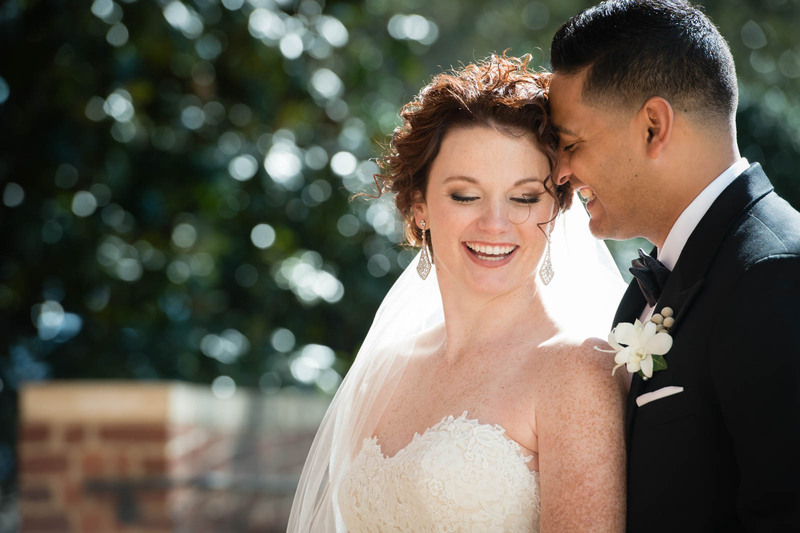 Shot in Daniel Chapel at Furman University in Greenville, SC, the joyous newlyweds share an intimate moment of laughter. Daniel Chapel, Furman University is always so great to shoot weddings at especially since its right here in our home town, it really feels like home. Furman University has really out done them selves with the landscaping and the venue to make our bride and groom's day really something to capture. This brick chapel is set in the midst of Furman's campus over looking the pond. Walking up to this venue is breath taking with the tall doors framed by the massive columns on either side. Inside are large beams covering the high ceilings and rows and rows of pews to seat 352 friends and family. The focal point of this amazing venue is the Fisk organ that reaches to the roof as the backdrop for any ceremony. Outside the chapel are many intimate gardens and beautiful lake front areas. We ran away with the Bride and Groom for a few moments right after the ceremony and to take some pictures to capture their giddiness and laughter for finally being husband and wife. We found a intimate garden right near the chapel that had beautiful Oak trees and brick for the back drop. The brides glow was contagious, you just couldn't help but laugh and smile as well.